Half shaved is the way you may end up, when you run unconsciously into history: one opens a door and, instead walking in a barber's shop, gets into the populated hell of a tormented character. It's bad enough to get there - and even worse to get there and meet your own projection in a troubled man's mind. 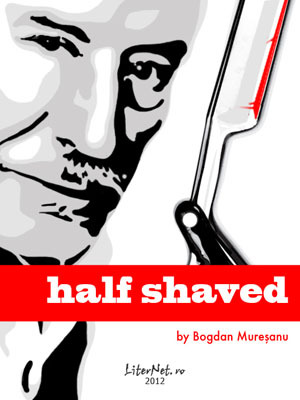 I must admit that I liked the Half Shaved phrase for itself, even before reading the script. There's something attractive about things half done, as for things perfectly done. And, since just doing things is not enough to incite readers or viewers, the story goes like that: Vasile, a barber, is waiting, in the empty parlor, for a client - or he doesn't wait for anything, anymore. While waiting (or not waiting), a client walks in. Is he the one Vasile waited half his life? May be. And, if so, what could happen from that moment on? It's not a Greek tragedy, although it might just as well be one: is Fate bringing them together, to test Vasile's mental strength? Or it's just a coincidence? The tortured Vasile turns, quite subtly, in a torturer, frightening his client, in a scene which reminded me of Charlie Chaplin. Yet, as this is not a comedy, neither bitter, nor black, the former (possible) torturer from Vasile's past during communism is experiencing real awe, real emotions, so that the story is much more an individual one, instead of a metaphor of a larger social problem. People experience hate, fear, oblivion, and forgiveness differently, and the greatness of this story is the way Vasile is getting over his past, dismissing a half life of hatred and rancorousness.